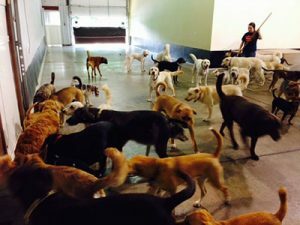 Go Fetch Services (Originally simply named Puppy Daycare) was opened in 2002 by Matt Ramsey, a former IT Professional in Cincinnati. Matt Ramsey opened Go Fetch after not being able to resist his love for taking great care of dogs that stems back to his childhood. The Go Fetch philosophy is a product of Mr. Ramsey’s own set of priorities and goals for providing the right care animals need to be happy and healthy. Our goals are to keep everyone SAFE first and foremost, stress free and happy, so that everyone goes home WELL EXERCISED and SOCIALIZED!